Jonathan and I have had three cats since we’ve been married. That was our compromise since I didn’t want the responsibility and Jonathan wanted a dog (he has a real weakness for anything furry and newborn). 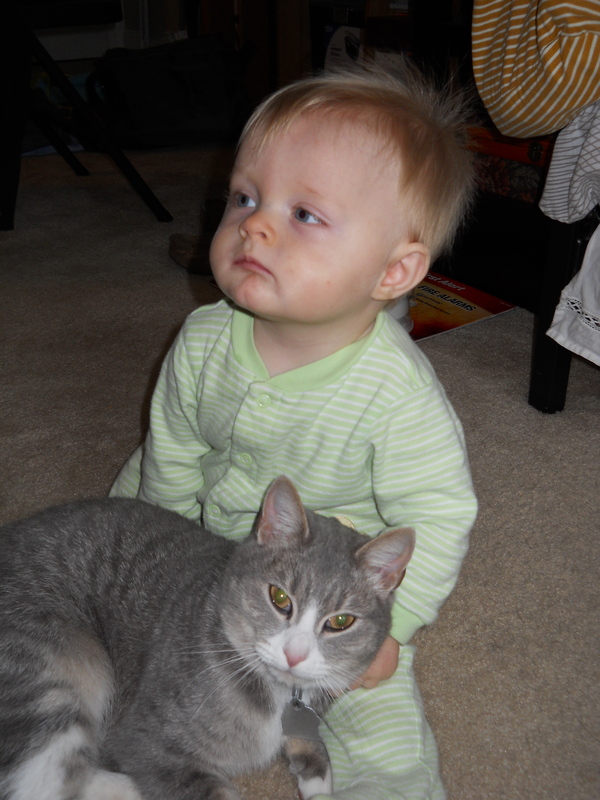 We’ve already had to put two of these kitties down: Arthur, a few months after we got him, and then Finnegan, two and a half years later. 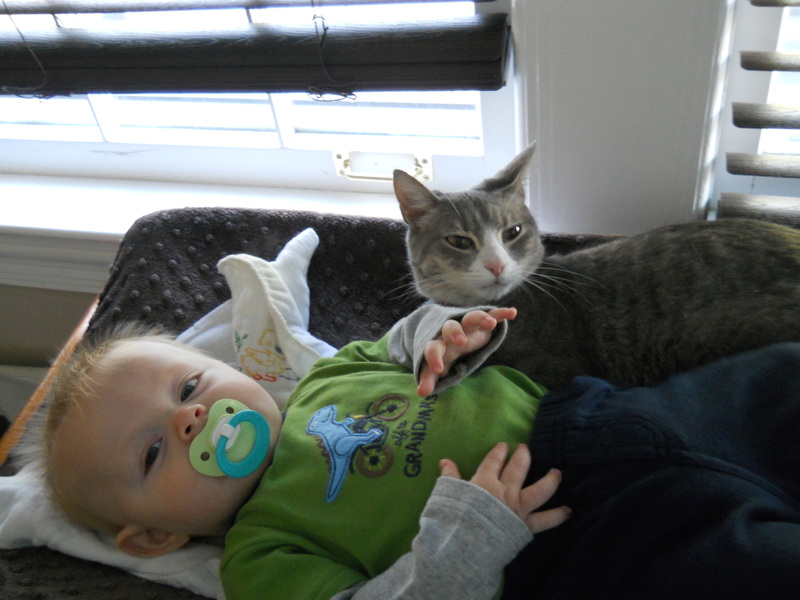 They were both great cats. Very sad. Not a great track record, I know (we fed them, I promise). The third cat is Lola, our little runt. We brought her home around Thanksgiving in 2009. My sister, Jena, found two little babies on the street in a metal cage and brought them home. She convinced me to take one kitten, already dubbed Lola, and she would keep her litter mate, Luna. Lola has always been a bit scrawny, so it is comical that she has been the last one standing. She even has fattened up (fluffed up, is more like it) in recent months. 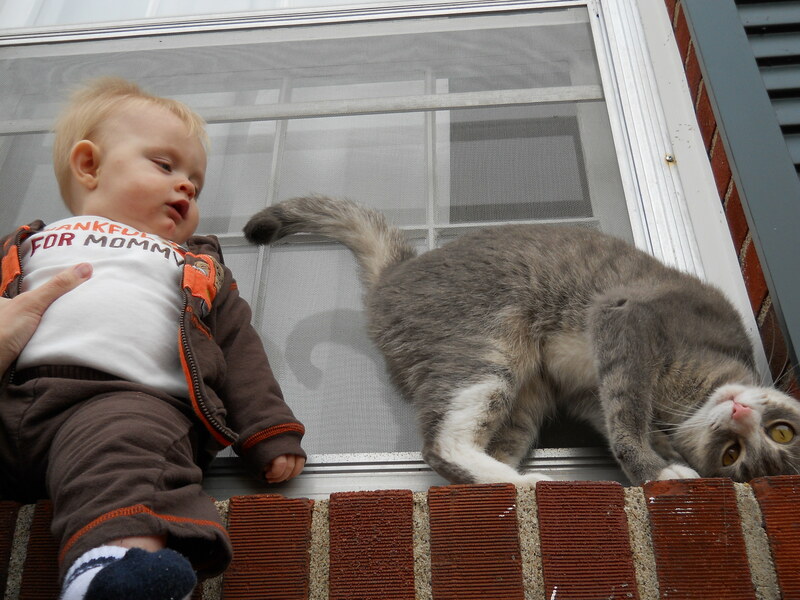 Liam has come to take a real interest in Lola ever since, well…he started noticing anything around him, really. And Lola thinks she wants attention from him until she remembers what gentle means for Liam. 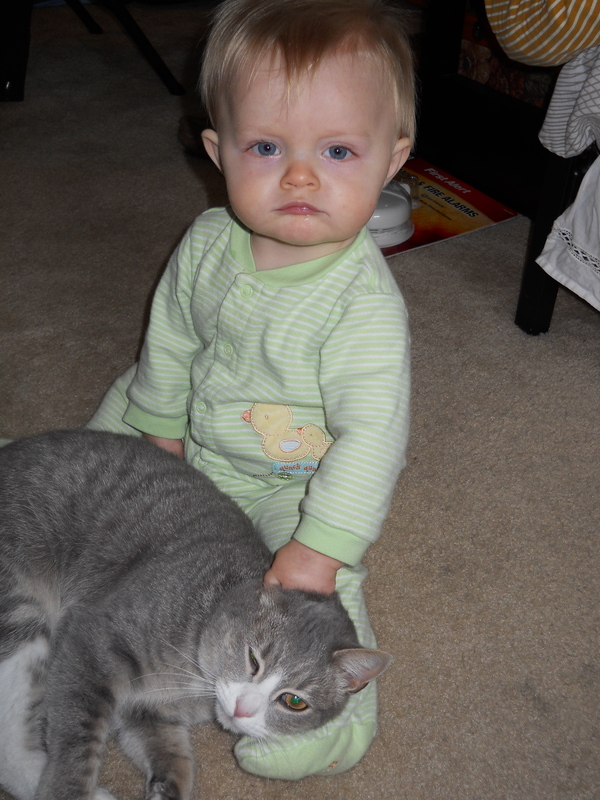 So she tolerates him. Just chillin' together on the changing table. 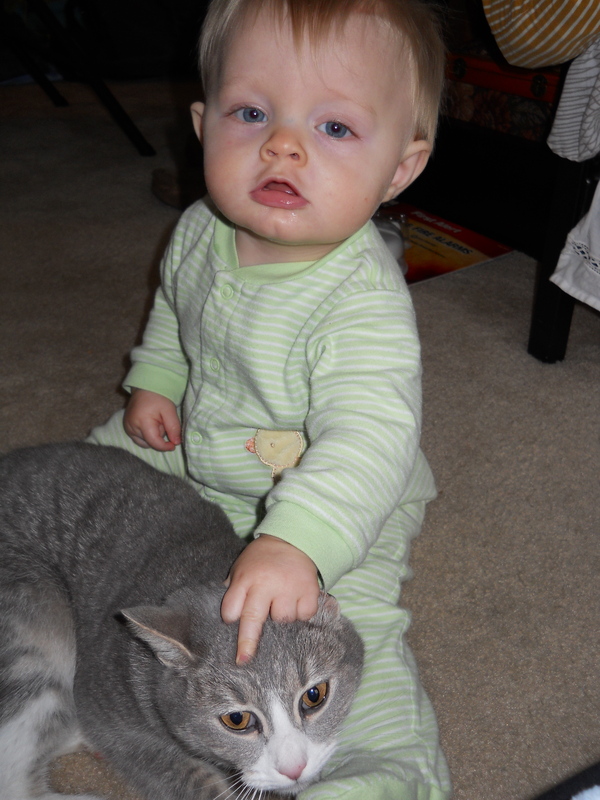 This is right before Lola gave Liam a "love bite" and he cried. I deleted that picture. Lola snuggles up and begs for some attention. Liam gets a little "aggressive" when she tries to escape. The hand...Liam, inappropriate. 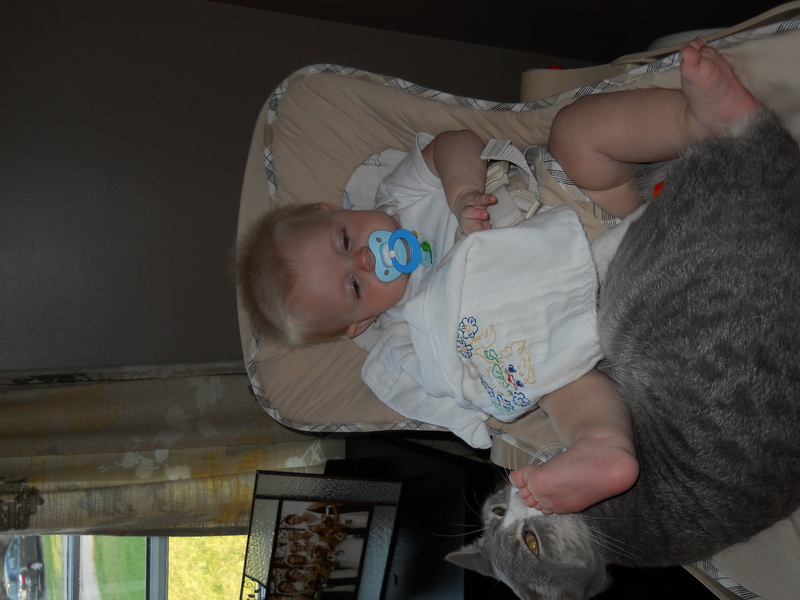 He takes his anger about Mommy's rebuke out on Lola. 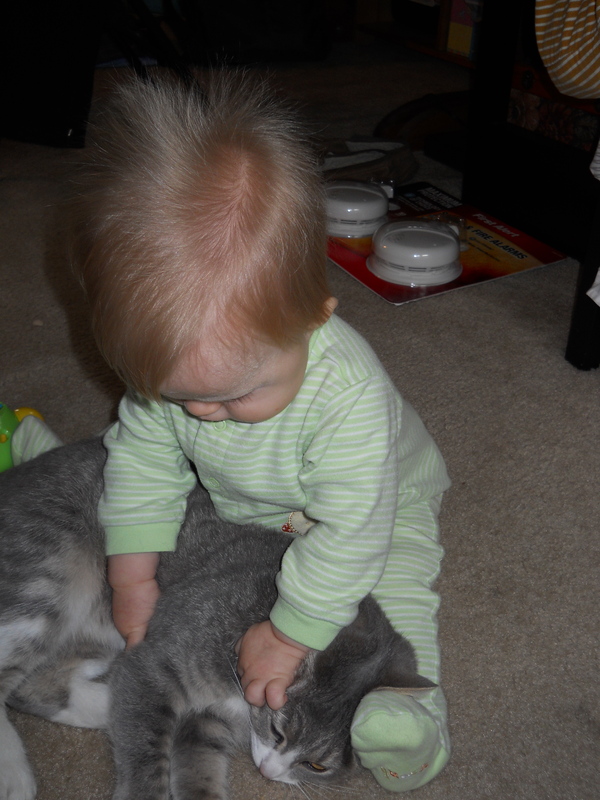 Liam decides it's time to wrestle! And now he praises himself for a job well done. 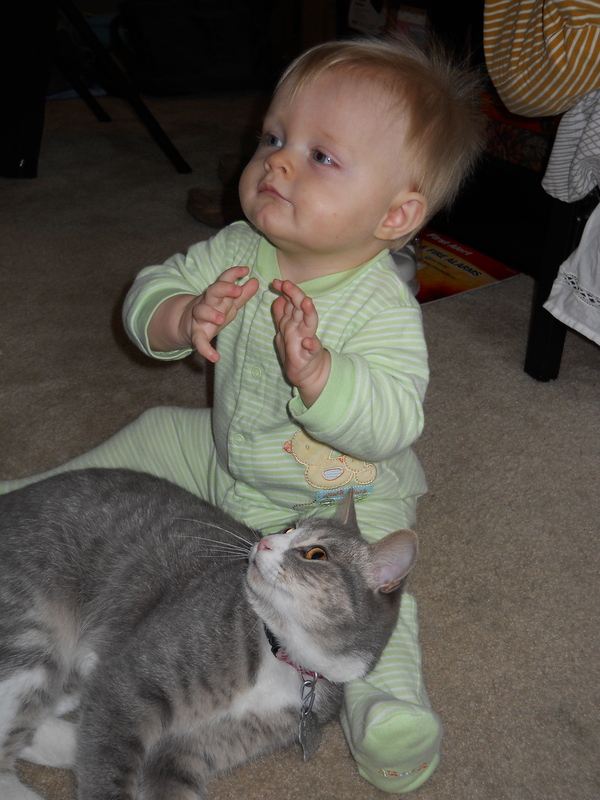 Such a patient cat, that Lola. It's Lola's turn to steal the show! The rain and humidity the last few days has prevented me from completing my jewelry rack. 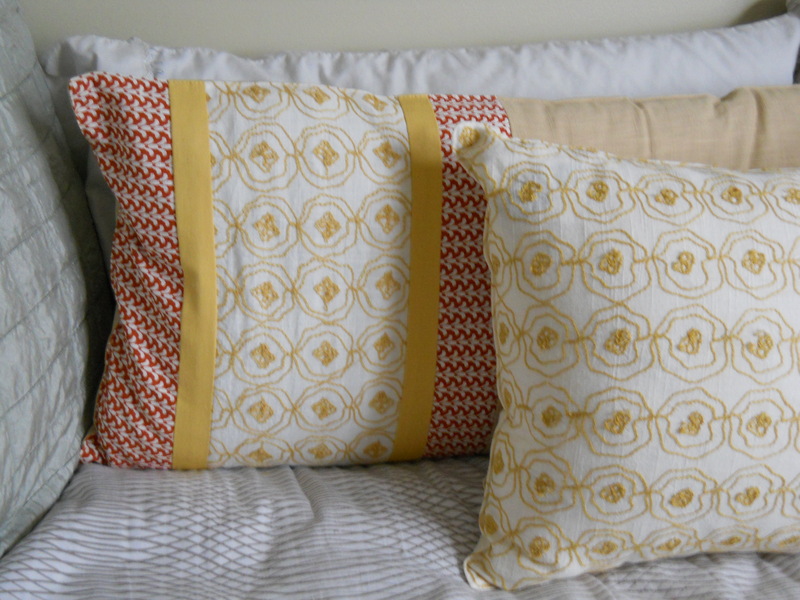 😦 So, I thought I would post a bonus DIY project (errr…I mean the FIRST DIY project on this blog): DIY decorative pillow covers! Sometimes, the bed/couch irritates me a little, because, well, it looks like a bed in the den, and it can be awkward to sit on comfortably. I tried to help both problems by putting plenty of pillows on it. 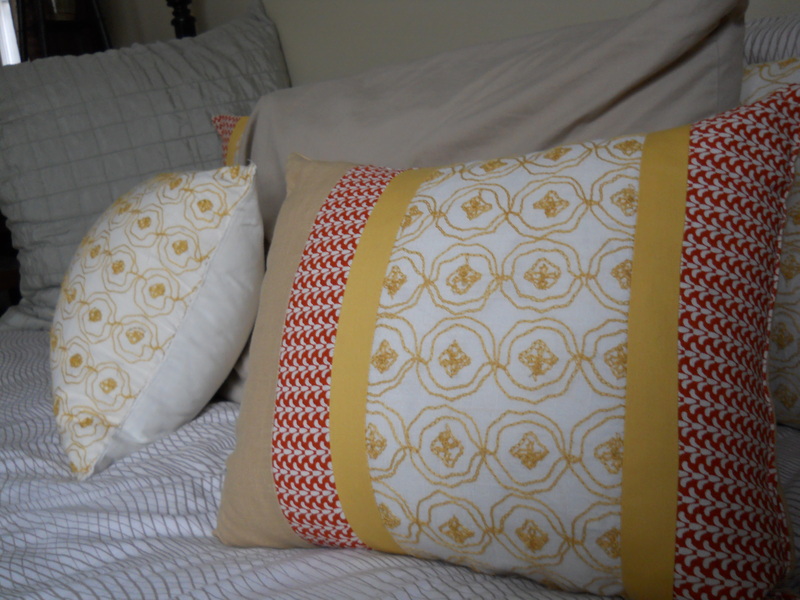 But, alas, I didn’t have pillow shams that I liked or that matched. 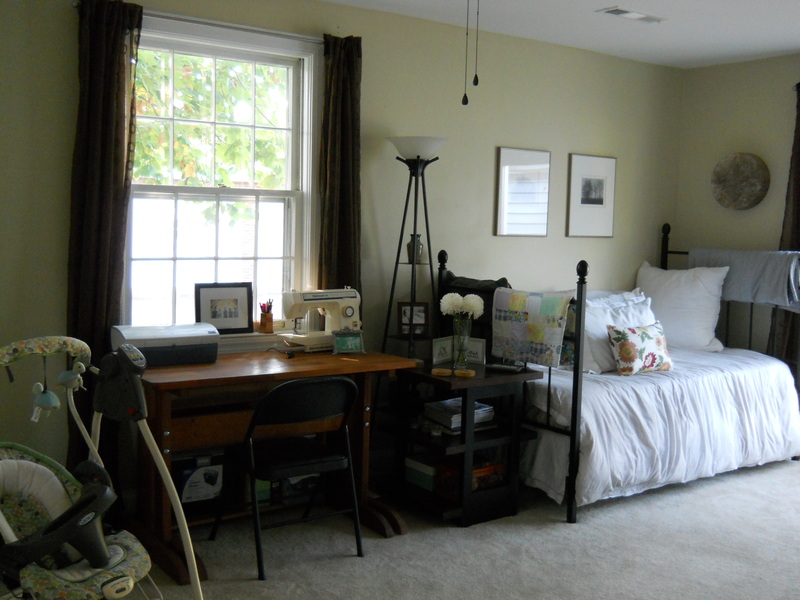 I’ve been in search of some pillow covers for a while, but they can be expensive (even on clearance) and our budget didn’t exactly allow for that kind of “splurge”. So, whenever I’m at a store, I like to look at their fabrics, including shams, tablecloths, sheets, etc. to see if I can get inspired. The other day at Target, it finally came together! 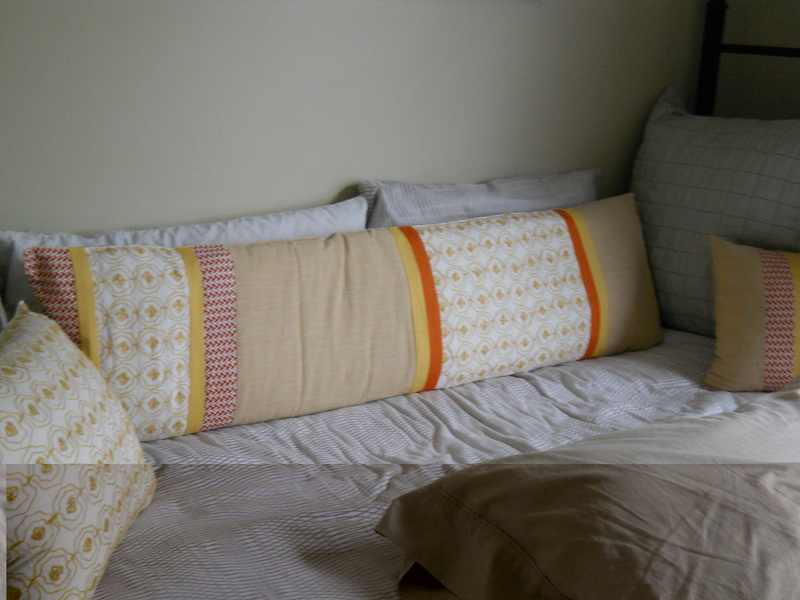 My friend, Liz, had showed me the coolest trick a few months ago for turning a placemat into a decorative pillow. So awesome (not to mention, cost effective and easy)! All you do is use a seam-ripper to open one side on the placemat, then stuff it, and re-sew that side closed again. Genius!! I was perusing the sales at the placemat and tablecloth section, when I noticed they also had super fun table runners on clearance as well. Then I thought, I wonder if I could use the table runner as a pillow cover for the body pillow on the bed in the den? I totally wasn’t expecting it, so I hadn’t even taken any measurements or anything, but decided to give it a shot and just return it later if the sizing was way off. 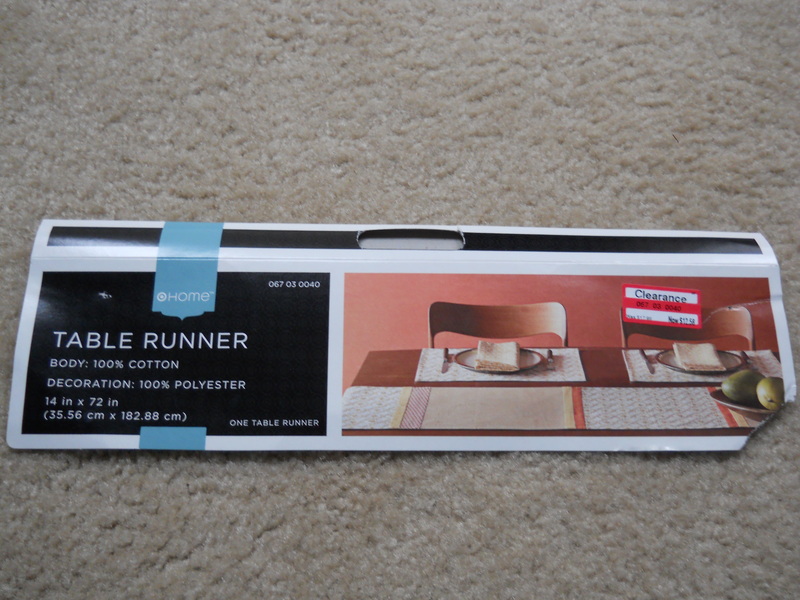 I bought one table runner ($12 and some odd change) and one corresponding placemat ($2 and some odd change). Guess what? It worked! Or, I made it work, anyway, because I was so excited about it! I will say that another 0.5-1″ in width would have really fit a lot better (and made it a ton easier to stuff). After using some elbow grease to stuff a regular-sized pillow into that little placemat, I stitched it back together, and Voila! 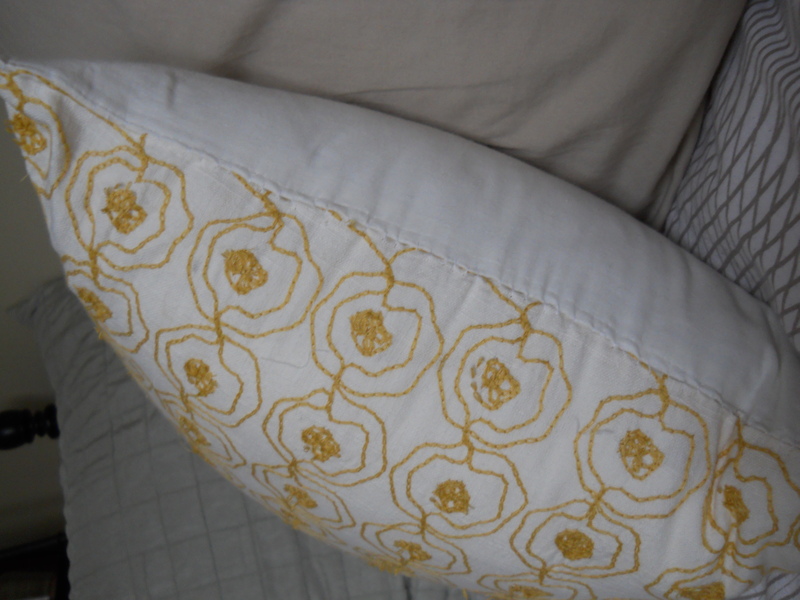 Homemade decorative pillow in minutes! As for the table runner, it was plenty long, so I just cut off the end, and…wait for it…made it into another decorative pillow! I don’t even know where these creative juices came from!! Here is the finished product! So easy. And likely cheaper than it would’ve been if I bought straight fabric with this much personality. 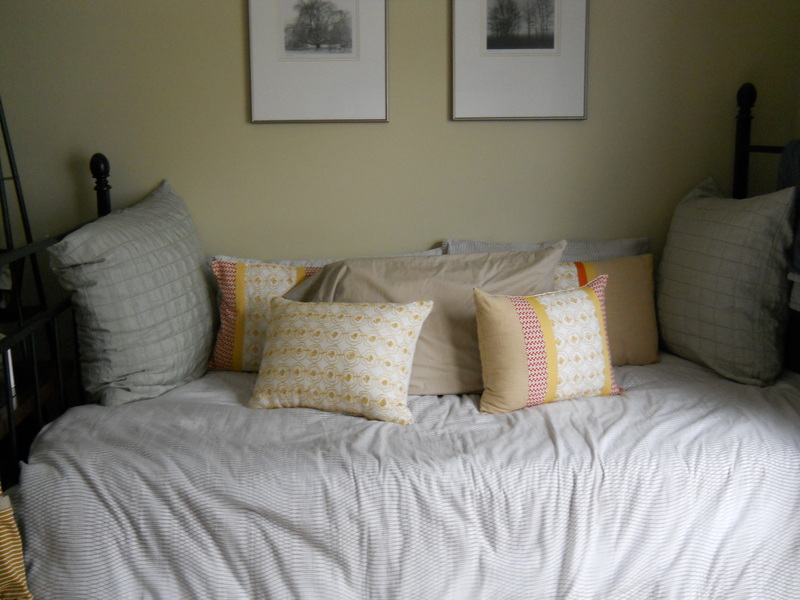 The next step: recovering the big pillows on either end with something that coordinates. I’m excited! The best part of all? I had a Target gift card from Christmas for $15, so it was F-R-E-E! So, my first instinct after writing the last post was to DELETE it. I fretted over if I really wanted to do this.I edited it before anyone, save 1 or 2 critics, read it. I wrote it 3 days before I shared it. I really debated about whether or not to post it to facebook. It’s just so…public. You sorta lose control over knowing who your audience is. I was worried about what people would think of it. Not so much about what someone might think about my writing or my opinions, but would they understand what I was trying to say? Sheesh! you might say. Why the heck am I doing it if I’m so worried about it? Part of my stress implies that I’m assuming people will actually be reading my blog! Can you tell I over think things? Well, all of my concern about it is part of the reason that I think I should do this blog. I’m hoping that I’ll become less perfectionistic with time. That’s why I will NEVER be writing a book. It’s too permanent. There are a million ways to say something, and I don’t think I would ever be satisfied enough with the way I express something to put it in hard copy for the world to see. You know what’s even more ironic? My name, Samantha, means listener! I’ve always felt a little like it is the thorn in my side, always there…reminding me that I feel a bit like a fraud. A month or so ago, I was playing Imaginiff… with my husband’s family. The question was about me. Something about which person would I be on a construction site. EVERYONE, except me, voted on the one barking orders to people. Did I really seem like that person? And how did everyone know that about me? I’m afraid of admitting that part of my personality (to myself, even), but apparently I’m not very good at hiding it! I’ve been told, on more than one occasion, that they think people misunderstand me. What does that mean? How do people see me? No one (at least, I think) likes to feel misunderstood. The truth is, there are good things about being strong. Being verbal. Being concerned with what’s right. But strengths can be weaknesses and vice-versa. The trick is to be honest with yourself about what those are and then work at maximizing the parts where it’s a strength and minimizing the parts where it’s a weakness. That’s why getting comfortable with admitting certain aspects of my character is one of my Resolutions for 2012. *DIY jewelry rack post to follow! soon…hopefully. I’ve been thinking about starting a blog for a while, but worry that my life isn’t interesting enough to read about. Along with becoming more interested in blogs in general, I’m desiring a new way to unload everything that’s been on my mind. A public, virtual journal of sorts. Kinda scary. Anyway, lately I’ve been thinking a lot about resolutions. I don’t really know why. I never make resolutions. I do like to stop and evaluate my life periodically, but on a smaller, more consistent scale than New Year’s Resolutions. I’m not much of a goal-setter. Sounds kinda sad, but I think it’s because I’m a realist. I like to make decisions based on the choices in front of me. Bam. Keeping it real-like. I think I’m entering a season of change, which is funny because the dust is finally settling on a lot of physical changes in my life. Last year I had a baby. I had a change in my job. We bought a house–and moved. But now I feel like I’m embarking on some changes of the more internal-nature. Becoming someone’s mother is a life-changer, for sure. I love every minute of being with Liam Knox. I mean, have you seen the kid?! He’s amazing. But being wrapped up in this thing called parenthood makes it easy to have some of me get washed away in the process of raising him, if I’m not careful. I don’t want that. I’m not just a mom. I still need my brain stimulated. I still need to share my gifts. I still need to do things that I love to do. Just because. I need to do those things for me. I need to do those things for Liam. I need to do those things for Jonathan, and for everyone else who knows me. I need to walk in the fullness of who I AM. Nobody else can do it. I guess that makes these (and many more, unlisted) my resolutions for 2012. Happy New Year, everybody!